I paid all my taxes due by April 15th, there should be no penalty! Such was my argument with the IRS after learning I was being hit with an “underpayment penalty”. I was not a happy camper…the penalty amount was one thing, but the principle of the matter really bugged me. I had worked a variety of part-time jobs during college and in this particular year my cumulative tax withholdings was on the light side so I had to make up the difference when I filed my tax return. I assumed as long as I paid the tax balance due by April 15th, all was well. However, while discussing the matter with the IRS, I discovered my argument didn’t hold water. That day, I learned an important fact about income taxes: the April 15th deadline for filing the income tax return is a completely separate issue from when the IRS requires that income taxes must be paid. The federal income tax is a pay-as-you-go tax, meaning we must pay income tax as we earn it during the year. If we don’t pay enough taxes while we are earning it, then the IRS will assess an “underpayment penalty”. It sounds crazy, but it’s possible to overpay your taxes during the year, receive a refund when you file and still be assessed an underpayment penalty! The difference maker is when you pay the taxes. The IRS allows for two ways to pay-as-you-go: withholding and estimated tax. Most of us have been employees at one time or another so we are very familiar with withholding. It’s a very structured process with a lot of handholding to make sure employees jump through all the proper hoops: employees submit a W-4 when hired, human resources and/or payroll staff are available to ensure all the bases are covered, payroll software calculates the amount of withholding based upon IRS tables, etc. Also, an employee will receive 24 or more paychecks per year and an end of year W-2 so there is a lot of documentation and feedback built into the system to monitor earnings and the amount of taxes withheld. Self-employed individuals use the estimated tax option. Compared to the finely-tuned withholding process, estimated tax is more like the Wild West. Self-employed individuals are lone rangers often shooting from the hip when estimated payment deadlines appear on the horizon. Completing a tax return is hard enough after the tax year is over. Trying to calculate your tax burden at the beginning or during the middle of the year based upon projected income and speculation about expenses both business and personal is about as easy as using a six-shooter to plink a fistful of coins tossed in the air. Note that estimated tax covers both income and self-employment taxes (1). The IRS combines both taxes in a single bucket when it calculates whether an underpayment penalty should be assessed. IRS Form 1040-ES provides instructions and worksheets to determine if you need to pay estimated tax. In most cases, if you expect to owe at least $1,000 when you file your tax return, the IRS requires that you pay estimated tax. TIP: It’s not unusual for RVers to have a combination of self-employment and W-2 income. If this is your situation, increase your withholding to cover all of your income sources to ensure you owe less than $1,000 when you file, and thus avoid the need to pay estimated tax. If your only income is from self-employment and you anticipate paying at least $1,000 in income/self-employment taxes, then you must pay the estimated tax (3). Note that most states also have estimated tax requirements and underpayment penalties. They are often similar to the IRS formulas and rules of thumb for who must pay. 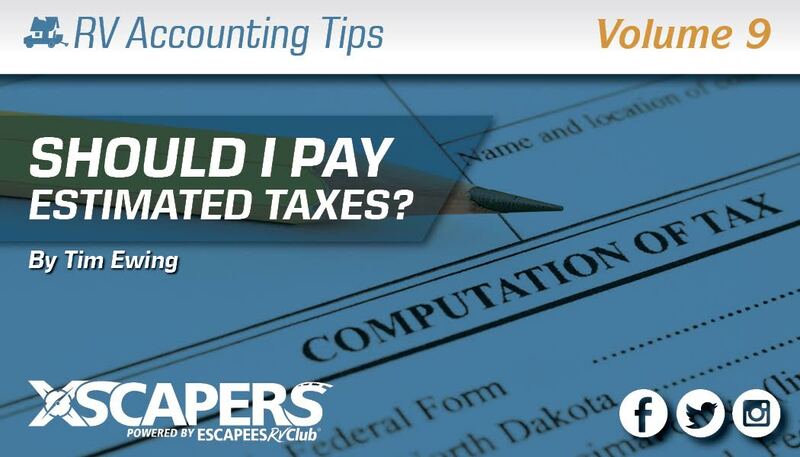 Be sure to investigate these topics with any state to which you might owe income taxes. If you are required to pay estimated tax, be sure to read my next article, How to Avoid the IRS’ Underpayment Penalty. This will help you understand both the proper timing for when to make estimated tax payments and how to calculate the proper amount to avoid the underpayment penalty. Self-employment tax is calculated as 15.3% of business net income and is the counterpart to the employee/employer FICA tax. Through withholding, employees pay FICA at 7.65% of their gross income and the employer pays an additional “matching” FICA tax of 7.65% (7.65 + 7.65 = 15.3). Note the difference in terms between “tax owed” and “total tax burden”. In the former case, I am referring to the amount of tax due when you file your return, which is the total tax burden less what you’ve already paid (e.g. withholding and estimated taxes). Total tax burden therefore is the total tax you owe for the year before taking into consideration withholding and estimated payments. Tim and Janette Ewing travel the country living in their fifth-wheel RV while homeschooling their 15-year old son Luke. 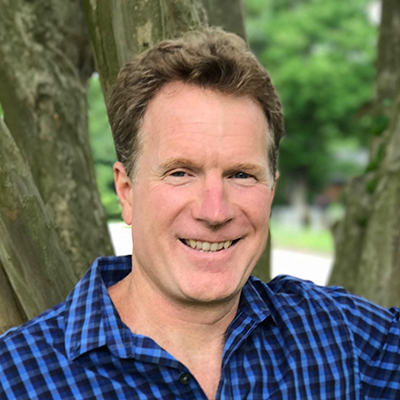 Tim has been a CFO for 30 years working with small businesses and non-profits and currently runs his CPA practice full-time while on the road. 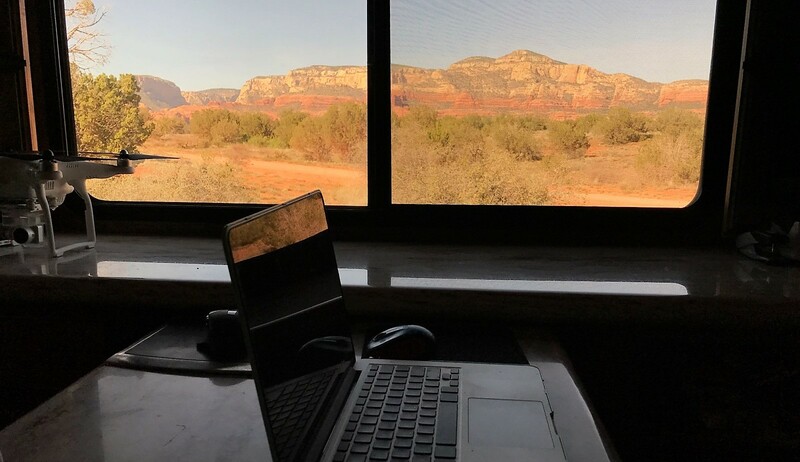 Tim specializes in helping self-employed RVers unload their bookkeeping burdens and avoid IRS headaches. You can reach Tim at www.quest-cpa.com.